Installation of a sandstone retaining wall and patio as well as a shed base. More info about this project. The pergola was part of a large landscaping job at a customer's property, the contract was done in stages over a couple years as requested by the customer. More pictures in the gallery of the garden. This is Hemingford Grey House which is a Grade II listed property. 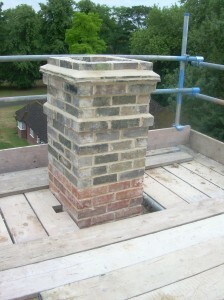 We had to make repairs to severely damaged chimneys. 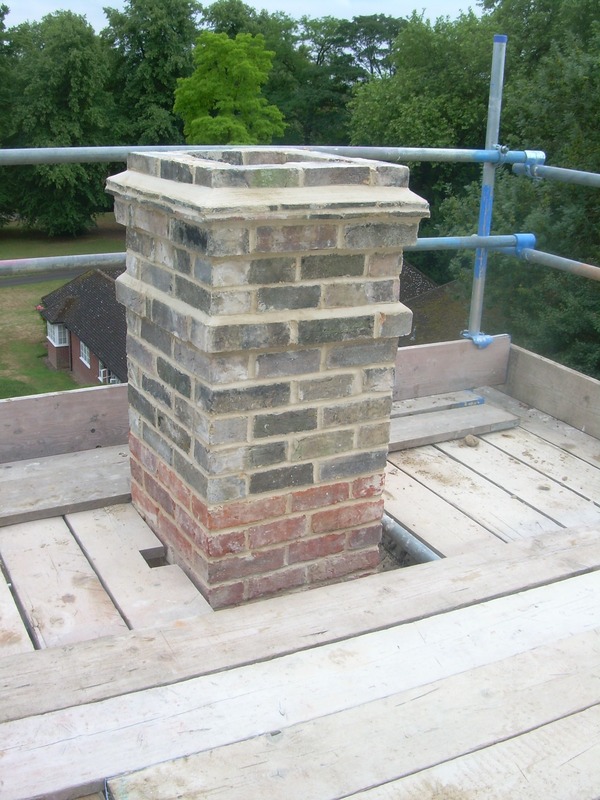 The work which was carried out had to meet the strict specifications of English Heritage. TDJ Construction are fully licensed and insured. You can view our documentation here. We’re able to clear and clean your gutters removing all debris and clean them by removing dirt and grime. This includes Soffits, Fascias and Conservatories too. Contact us and please specify if you require your gutters cleared or cleared and cleaned. Replenishing Gravel Driveways and gated fencing. Making a home stand out. We offer many services for your home or business renovation, from carpentry, plastering, roof repairs, garden walls and brickwork repointing through to fitting kitchens. We are also available as bricklaying contractors and have worked on various bricklaying projects, notably for English Heritage. Our garden landscaping services include the building of retaining walls and shed bases as well as the construction of patios and pergolas. We offer many other services and have many sub-contractors available so if you're unsure whether we can help please contact us and we can discuss your plans and ideas. We are a small local construction company who operate throughout Northamptonshire, Cambridgeshire, Buckinghamshire and Leicestershire who deliver First Class workmanship and service. We pride ourselves on our ability to leave customers satisfied and pleased with work undertaken. Our principle areas of expertise are Renovations, Landscaping, and Bricklaying but we also offer Pressure Washing and Guttering Clearing & Cleaning services. All Trades used are qualified and hold all the necessary Public Insurance Liability. We are also observant of all current laws of Health and Safety Regulations. Please look at the following pages to see examples and high standard of work carried out by TDJ Construction. 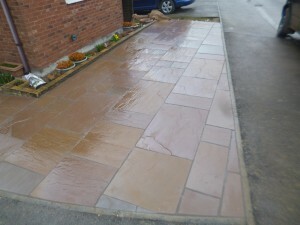 This Indian Sandstone Paving was laid for a customer in Kettering. At TDJ Construction we take great pride in our work and believe that customer satisfaction is paramount. Please feel free to take a look at our Recent Projects which shows many different examples of the work we carry out for our customers throughout the areas we service and demonstrates the high standard of our work. Grade II listed Hemingford Grey House had some severely damaged chimneys which we were able to repair. Our Client List includes many local businesses and construction firms throughout Northamptonshire, Buckinghamshire, Cambridgeshire and Leicestershire as well as Schools, Commercial and Domestic Premises. For whom we have carried out varied works ranging from garden landscaping, renovations, repointing and roof repairs. We have also undertaken work for English Heritage as a sub-contractor through Kevin Wager Project Management on Hemmingford Grey House. Please refer to the Gallery for further examples of work and quality.